Miss Universe 2015 Pia Wurtzbach was reunited with Miss Universe 2014 1st runner-up Janine Tugonon in New York City. After taking a short break in the Philippines, Pia is back in the Big Apple which coincidentally is also the current residence of Janine, who is a model there. 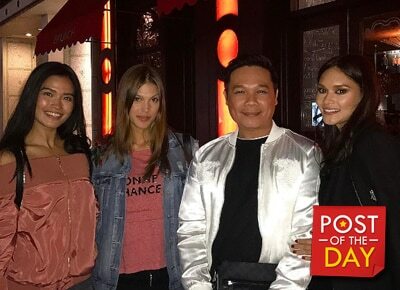 Mercator’s President and Manager Jonas Gaffud posted a photo of himself together with the two beauty queens and the current Miss Universe title holder Iris Mittenaere. Lovely dinner with these three beautiful ladies, @tugononjanine @irismittenaeremf @piawurtzbach ???? ?#sexandthecity #iamsamanthajones ????? ?